This blogpost is mostly based upon a part of the talk I recently gave at the Haskell eXchange. I discussed scope checking – also referred to as scope analysis or renaming. While the talk focussed on Ludwig, a DSL used to program Fugue, the ideas around scope checking are broadly applicable, so in this blogpost we use a simple toy language. This part of a Compiler/Interpreter is concerned with resolving occurence names to full names. Occurrence names are just what the programmer uses in the source file, and full names contain more information. I think this is an interesting area to explore. The vast majority of articles about creating parsers and interpreters just use Strings as names, in order to keep things simple (which is of course fully justified). This blogpost, on the other hand, explains what you can do if things become a bit more complicated. -- Just an example of what sort of things can be in 'FullName'. Note that this is just a toy example. Firstly, we can use more efficient representations for the above, and we might want to add newtype safety. Secondly, we might also want to store other things in FullName, for example the package where the name originated. The FullName record can really get quite big. 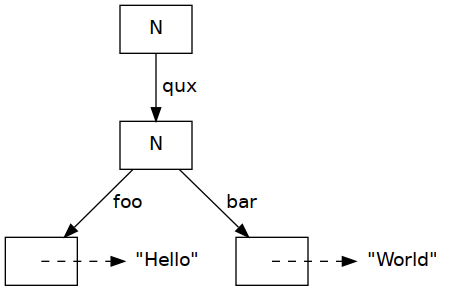 Now that we have two name types – OccName and FullName, we can parametrise our abstract syntax tree over a name type. Now, we can formalise the problem of scope checking a bit more: it is a function which turns an Expr OccName into an Expr FullName. In order to implement this, it is clear that we need some sort of “Map” to store the FullName information. The specific data structure we will use is a Trie. Tries are somewhat similar to Radix trees, but significantly more simple. We will implement one here for educational purposes. However, there is a nicer representation which we will need in order to support some fast operations. First, we need a quick-and-dirty strict Maybe type. Note how we automically added Foldable, Functor and Traversable instances for this type. Thanks GHC! We can have a value at the root (tValue), and then the other elements in the Trie are stored under the first key of their key list (in tChildren). Let’s draw the empty Trie as a simple box with an N value, since it has no value and no children. We can also define a function to create a Trie with a single element. If the list of keys is empty, we simply have a J value at the root. Otherwise, we define the function recursively. 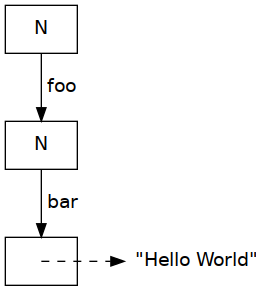 As an example, this is the result of the call singleton ["foo", "bar"] "Hello World". We can skip insert and simply create a unionWith function instead. This function unifies two Tries, while allowing you to pass in a function that decides how to merge the two values if there is a key collision. A last function we need to modify tries is prefix. This function prefixes a whole Trie by nesting it under a list of keys. Because of the way our Trie is represented, this can be done efficiently and we don’t need to change every key. These are all the Trie functions we need. A real implementation would, of course, offer more. Now, recall that we’re trying to resolve the occurrence names in a module into full names. We will tackle this from the opposite direction: we’ll gather up all the names which are in scope into one place. After this, actually, resolving an occurrence name is as simple as performing a lookup. In order to gather up all these names we need some datatype – which is, of course, the Trie we just implemented! We will differentiate between two different kinds of scopes (hence the a). An AmbiguousScope might contain duplicate names. In that case, we want to throw an error or show a warning to the user. In an UnambiguousScope, on the other hand, we know precisely what every name refers to. Let’s first focus on building AmbiguousScopes. We will later see how we can validate these and convert them into an UnambiguousScope. In order to build a scope, let’s start with a simple case. Let’s look at a sample module in our DSL and construct a scope just for that module. We can define a function to convert this module into a local Scope which contains all the bindings in the module. In order to keep things simple, we assume every binding in a module is always exported. -- An apple and an apple pie! Finally, converting the AmbiguousScope into an UnambiguousScope. The first one is easy, since we have our Trie machinery. It is perhaps worth noting that this behaviour is different from GHC 2. I have described a simple and (in my opinion) elegant approach to scope checking. I hope this is inspiring if you ever are in the situation where modules would be a nice extension to some DSL (or full-fledged programming language) you are implementing. We’ve also seen how one can implement a Trie in a reasonably easy way. These often come in handy when you are modelling some sort of hierarchical Map. This entire blogpost is written in Literate Haskell, and works as a standalone example for scope checking. If you feel up to the challenge, try to add Let-bindings as an exercise! You can find the raw .lhs file here. This is the rest of the source code to this blogpost, in order to make it testable (and hackable! ).